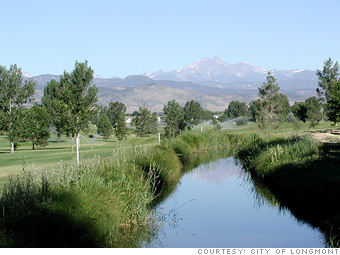 The name "Longmont" comes from Longs Peak, a prominent mountain named for explorer Stephen H. Long that is clearly visible from the city. Founded in 1871 by a group of ex-Chicagoans, it's a Coloradoan oasis, with more than 300 days of sunshine and a spectacular view of the Rocky Mountains. Sure, the 1,500 acres of parks and open space attract outdoor enthusiasts, but a vibrant restaurant scene and high-tech employers such as Seagate and Amgen and popular shoe company Crocs keep them there. (3) Crime incidences are estimates based on FBI 2006 Universal Crime and incidence reports, OnBoard analysis. Do you live in a great place? Does your city have great cafes and culture? Lovely affordable homes? Low crime and a thriving downtown? A thriving local economy? Amazing neighbors? Show us why your town is remarkable: Send your photos and videos, and they could be profiled in an upcoming story.